Although blue may be associated with feelings of sadness, this color actually has many positive symbols and meanings that even color therapy experts recommend using for a home’s interior design. Known as a calming color that brings any room a sense of tranquility, blue can be used to bring beneficial effects into your life. Dip your toes in our blue Color Chronicle, and discover the beauty of blue in various items made by awesome Etsy sellers! Whether for children or for weddings, you’ll find something that can be used for nearly every occasion in our blue items guide. Dedicated to this lovely color of wisdom, peace and spirituality, our blue Color Chronicle is filled with creative, imaginative and just plain fabulous handmade products! 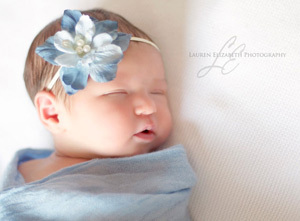 Give your baby girl an elegant flower headband from Craft Mom Of 3 Boutique! Vintage-inspired and stunning, this blooming flower headband presents a large blue flower with various hues of blue and centered with three simple yet elegant pearls. A skinny, comfortable elastic band makes this beautiful flower wearable and doesn’t harm your little one. You can also customize the color of the headband by sending in a custom request to Craft Mom Of 3 Boutique. 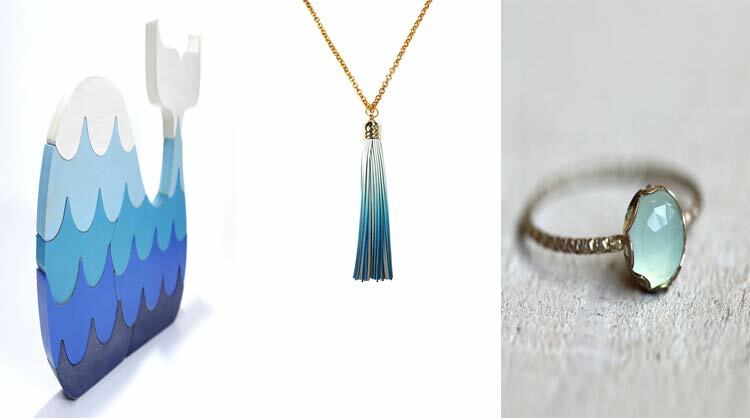 Embellish your everyday attire with Pop Culture Junkie’s blue ombre tassel necklace! 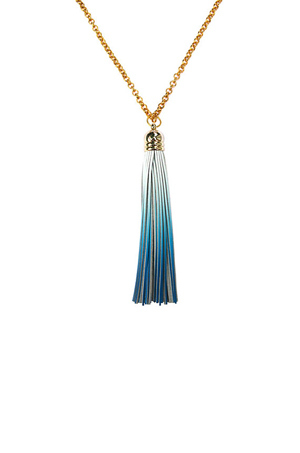 Featuring a fun leather tassel with blue ombre coloring, this necklace has a boho-chic edge mixed with a modern style. The tassel charm is looped through a round aluminum rolo chain, which measures 32.5 inches long. 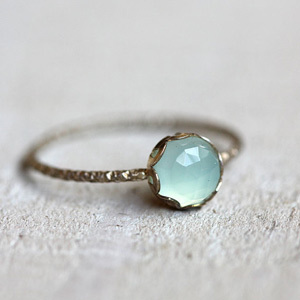 Adorn your fingers with Praxis Jewelry’s blue chalcedony gemstone ring! With a rose cut design, the eye-catching, mesmerizing blue chalcedony gemstone is placed in a slim sterling silver band with a scallop designed setting that has a slight antique edge. This ring is offered in nearly all sizes from U.S. 4 to 11 and includes quarter and half sizes as well. Have your own winter wonderland with My Imagination Is Yours’ aspect tree painting! With a vibrant turquoise blue background, this painting presents black, white and grey aspen trees in various sizes that beautifully contrasts with the blue background. Made with acrylic paints in a textured style, this stunning artwork is a wonderful addition to your living room or den. This painting runs across three canvases, making it a modern-styled, multi-panel masterpiece. 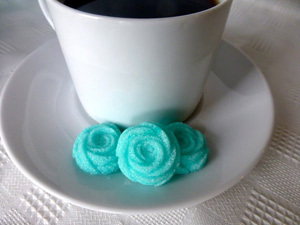 Enjoy your cup of tea or coffee with Whispers Of Blue’s rose-shaped sugar cubes! These quaint sugar cubes come in a Tiffany blue color and are hand-molded into detailed, elegant roses. Perfect for a fancy tea party or as a wedding favor for guests, this unique rose sugar cube can accommodate any occasion. The best part about these sugar cubes is that, despite their gorgeous blue coloring, they never taint any beverage with blue. This listing comes with three dozen sugar cubes. Extend your lashes in an eye-catching way with The Cat’s Meow’s blue peacock feather false eyelashes! These long, black lashes are attached with extravagant and vibrant blue peacock feathers at the ends. This set comes with two eyelashes, one for each eye, and can be reused multiple times if gently cared for. You can also find eyelash glue here in The Cat’s Meow’s shop. Make your iPad unique with Abstract Graph Designs’ blue funfetti iPad case! 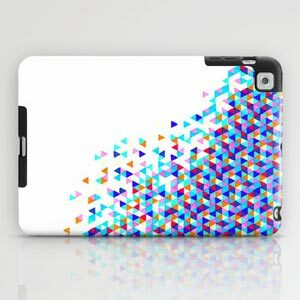 This original geometric design is printed on a durable yet slim iPad case, which can fit iPad 2, 3, 4 or iPad mini. With this multicolored wonder, your iPad can stand out from the crowd. This iPad cover is makes it easy to snap on and snap off your iPad and continue to use the iPad’s buttons without any trouble. Renovate your home’s lighting decor with Industrial Blush’s bubble light! These hand-blown glass orbs are dipped in blue coloring to give it a unique, edgy touch. 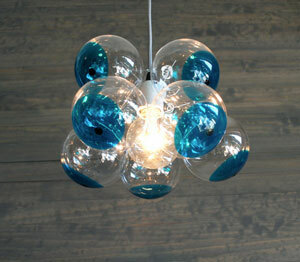 Clustered together, this bubble light is a fun, innovative way to spice up any pad. A black cord is included that measures 15 feet long and has a thumb switch. Have the ultimate luxurious bath setting with Art Glamour’s wooden candle holders! 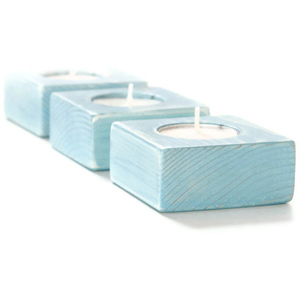 Dyed with baby blue coloring, these wooden candle holders can be placed around your tub for a relaxing and romantic bathroom setting. You can also use these chic candle holders as a table setting for an elegant family dinner. 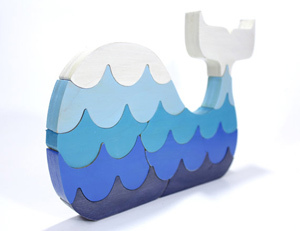 Keep your child busy with Berkshire Bowls’ mind-stimulating, whale-shaped wooden puzzle! Each puzzle layer is designed to look like thrashing waves and is painted with white and various, cascading shades of blue. This 11-piece puzzle can also be used as a child’s room decoration or a quirky addition to a nursery. Made from plywood and painted with non-toxic paint, this durable puzzle is safe for your children to play with. As one of the cool, primary colors of the Color Theory’s famous color wheel, blue is not only part of these handcrafted goods, but also a part of nature. From the ocean to the sky, Earth is covered in this lovely, serene blue shade. Appreciate this naturally produced color everyday, whether you take up one of the blue-colored items from our Color Chronicle or take a short walk to your car on a sunny, clear blue sky day! Check out our other Color Chronicles, featuring red, orange, yellow and green! Next up is purple, so be sure to come back super soon to catch our release of this royal color in our Color Chronicles series.